Click here to view stories from "Candles in the Window". Stories are valuable. Everyone enjoys a good story. Everyone has a story to tell. 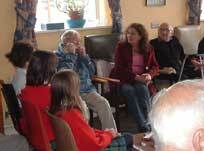 Reminiscence sessions are very important for a great many reasons. The experiences which all of us have in our lives are a valuable resource. Like fine wine, they become more valuable as they age. Stories of everyday events can provide information that may be available nowhere else. Not long ago I was sharing stories, just before Christmas, with a group of older people in a daycare centre. I was asking them about how Christmas had changed in their lives. It was hard going at first because they saw nothing significant or unusual about the stories they were telling. Yet, to me, and to the children to whom I showed the finished book, Candles in the Window, these stories were fascinating and highly enjoyable. An elderly neighbour of mine, once overheard me identifying wayside herbs with my young daughter. We fell into conversation. "Oh", she sighed, "I wished I'd paid more mind to my Grandmother." She explained to me that her grandmother had known a lot about herb lore but she hadn't wanted to know. Now it was too late and she regretted her decision . Valuable stories can be so easily lost forever." Reminiscence sessions are most enjoyable. Once participants feel comfortable and relaxed everyone just enjoys a good chat. One story recalled seems to spark half a dozen more until it is hard to stop. I remember once using a few sound effects just to start conversation. I played the sounds of a thunderstorm, wind an rain etc. It launched a torrent of stories about storms we had known. I was brought up in London and was in London in October 87 for the hurricane. The stories went back and forth and we had a great time. When I was working on "Time Tales", an inter-generational project, the children were excited to find out they were going to be meeting a lion tamer's wife and an ex. Longford footballer who was also a yoyo champion. Reminiscence sessions are important. They are importance as oral history but they are equally as important to the story tellers themselves. Think how you feel when somebody takes an interest in something that matters to you. If the listener is genuinely interested, if he or she asks questions, wants to know more, you not only feel good about yourself but you remember more detail about the event. Reminiscence sessions help to develop self esteem and to exercise the memory, a practice that is as beneficial in later life as it is in the young. Taking mental excercise is essential to health and recalling stories. Keep things relaxed and informal. The facilitator is just there to get chat going. Make sure the accoustics and seating arrangement allows everyone to see and hear. Vision and hearing may well be an issue with some participants. Gently facilitate shy particiapnts by sitting nearby, including anyone who might not have confidence to join in. Try to keep the whole group involved. Conversations between neighbours may disrupt group story sharing. This isn't to say that these one to one conversations are not equally valuable. It is often a sign that it's time for a tea break. Recording sessions is important. I find that using a minidisc is effective. The equipment is pocket sized and the mike small. I can either leave it on or stop and start at will, giving me shorter tracks that are easier to transcribe. When I begin I always demonstrate the minidisc and show everyone how it works. If I am working with a group over several weeks, transcripts are always available. However, in every case, I find that the mike is quickly forgotten. When I finished the book, Candles in The Window the two groups involved examined copies with interest. One gentleman completed his perusal of the work and announced loudly, " There's not a word of a lie in it. That's how it was."